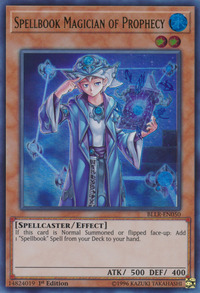 If this card is Normal Summoned or flipped face-up: Add 1 "Spellbook" Spell from your Deck to your hand. This monster appears in the artwork of Spellbook of Fate. This monster is based on the Tarot card, The Magician, the first of the Major Arcana. This card's Japanese name comes from the French name for The Magician Tarot card, Le Bateleur. This monster is holding the Spellbook of Secrets, which is appropriate because both of their effects involve searching for Spellbook cards. Spellbook of Secrets can search for this card due to Spellbook Magician having the Madōsho (魔導書) or Spellbook kanji in his name, since Secrets searches for any Madōsho or Spellbook card. This monster also looks similar to the Blue Mage Class in Final Fantasy Tactics Advance/A2: Grimoire of the Rift. This monster is the only Prophecy monster which has Spellbook in its name. This is a Mandatory Trigger Effect that activates when is Normal Summoned or flipped face-up. Even if is flipped face-up during the Damage Step, the effect will activate.